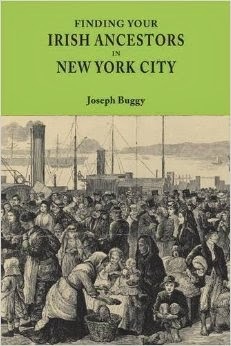 Beginning in the 1840s, thousands of Irish immigrants found jobs all over the eastern half of the United States building railroads. Researching these men and their families can be difficult due to the transient nature of their lives, lack of employment records, and the inherent dangers of the job resulting in high mortality rates. An excellent website, Clann Mór - The Blur Ridge Railway Project, is dedicated to researching the African-American slaves and Irish immigrants who toiled on the construction of one small part of the vast American railroad system - the Blue Ridge Railroad in central Virginia in the 1850s. "One of the poor men who work on the railroad had made a clearing among the trees in order to plant his potatoes. There are a great many Irish cabins on each side of the mountains, which reminded me of descriptions I have read of the manner of living of the lowest class in Ireland. They are mere hovels, & most of them have one or two barrels on the top of the chimney, but in some of them, we saw muslin curtains, a strange mixture of dirt & finery. The people are real Irish - wretched, miserable & dirty in appearance, but they hold on to Irish fun & Irish potatoes, as well as Irish tempers. Father called to a man who was at the door of one of the cabins & told him he had often seen double barreled guns but had never before heard of double barreled chimnies [sic], and he seemed very much pleased." The crowning achievement of the website creators is the fantastic Master List of Irish Workers and Slaves that those behind the website have created. Information for over 2,000 workers and their families is provided and was drawn from census, vital, newspaper and employment records. Some of the entries are vividly real: Morris Griffin died on 21 January 1851 with the notation remarking - "Irish blown up in large tunnell." Irish counties of origin are also provided for some of the workers as the creators of the master list utilized the Information Wanted Ads in the Boston Pilot newspaper as well as local records. Clannmhor.org. Clann Mhór - First Hand Accounts. Date Unknown. http://www.clannmhor.org/clannmhor/First_Hand_Accounts.html : accessed 1 October 2015. Original at: Diary of Mary Jane Boggs Holladay [manuscript] 1851-61. Call numbers MSS 6436-h. The Albert and Shirley Small Special Collections Library. University of Virginia.